When we first arrived in the huge building, the first thing we saw was this huge Mastodon skeleton towering into the air. Bryan was completely fascinated with everything about it. 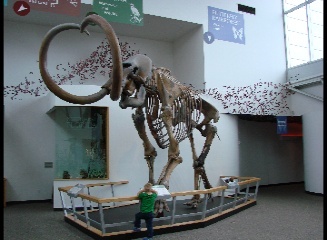 They also had a Mammoth skeleton, as well as a whole room full of prehistoric mammals found in Ancient Florida that was very interesting. This museum focuses on Florida Life in the past, its ecosystems, animals, peoples, and it's history. The fish exhibit makes you feel like you are a fish and underwater staring the huge blue crab in the eye! They had huge shark jaws that were big enough to swallow a boat! Bryan loved the Florida Cave exhibit, and learned about the caves that are underneath the ground here. He learned about the Florida Aquifer that is like an underground lake that gives us fresh water. The Butterfly Rainforest is right next door and is so worth the visit too! Florida Residents $8 and children 3-11 are $5. I paid $3 parking.